Project Perfect Mod :: View topic - Welcome to OpenRA Editing Forums! Posted: Sat Nov 02, 2013 12:07 am Post subject: Welcome to OpenRA Editing Forums! Subject description: Who commands the past, controls the future. Welcome to the OpenRA Editing Forums! This forum is the place you have to ask modding help, post your modding doubts and figure out new techniques to bypass the limits of the game and recruit members for your mod. Use the Private/Public Mod Announcements to tease and gather fans for your mod. -> OpenRA: The game itself, which comes with a map editor. -> NotePad++: This advanced text editor edits everything, including YAML files. It includes several features to make text editing much easier and it's totally free. -> XCC Mixer: This tool is useful to browse the .mix files, manipulate them and do almost any kind of conversion that you'd do for all assets. -> OS SHP Builder: This tool allows you to create and save .SHP files from both TD and TS file format. OpenRA is more used to deal with the TD format, although it seems to accept the TS one as well. OS SHP Builder produces reliable SHP (TS) files, while the SHP (TD) did not receive a proper amount of tests to confirm its stability. Remember that we hold no responsibility for these tools. Use them at your own risk. And finally, OpenRA also has a super-super secret placed known as http://content.open-ra.org/ where you can share and download resources for it. The https://github.com/OpenRA/OpenRA/wiki/Modding-Guide and https://github.com/OpenRA/OpenRA/wiki/Traits is probably a good reference for things everyone can do with a text editor. We recently added support for xcc local mix database.dat files so our in-game asset browser (Settings → Advanced → [x] Enable Asset Browser) will understand it. We also support the palette indexed PNG → SHP(TD) workflow and the Asset Browser wraps the command line utility with some GUI to make it a little more user friendly. See https://github.com/OpenRA/OpenRA/wiki/Pixelart for some tutorials to convert file formats, use our tileset builder (only included in the full SDK, needs to be compiled yourself) and a 3DSMax → SHP(TD) tutorial. This is not strictly true (sorry, I should have filed an issue about it at github long ago, but I keep forgetting), the problem is that community voxels use the XYZ scale values inside the voxel to scale it down ingame compared to its base dimensions, for a somewhat 'smoothing' effect, or to make it wider, shorter or whatever without having to redo the voxel. This works absolutely fine in TS and RA2, but OpenRA seems to treat those values as bounds instead, as a result any voxel with scale values lower than its actual dimensions will have parts cut off/shown at the wrong position. Basically, at the moment modders would have to set the scale values to values identical with the voxels' dimensions and use OpenRA's yaml scale trait instead if they want to make the voxel appear smaller. I should mention that our OpenRA IRC channel (http://webchat.freenode.net/?channels=#openra) is an excellent source of help you can receive from the developers directly. Bugs/issues/feature requests should be filed at http://bugs.open-ra.org/. Because then I'd start a build of my mod on this thing. Gladly with the amount of TS/RA2 assets scattered within the community, we could build anything now. Have a look at https://github.com/OpenRA/OpenRA/wiki/Hacking although it is very old. Ohgod... you don't even have a hierarchy?! I'm not sure if i want to work with this at all now... the actor individualism will gonna go bloated longtime. I don't want to praise WW but their class hierarchy was a lot better approach IMO. Maybe it does. The version 3.36 did corrupt some SHP (TD) files. I've tried to fix that in 3.37 and didn't see it corrupting SHP (TD) anymore, but nobody tested the result. you don't even have a hierarchy?! If you mean class hierarchy, then we have that, but more flexible due to our powerful rule inheritance https://github.com/OpenRA/OpenRA/blob/bleed/mods/ra/rules/defaults.yaml It saved me a lot of typing for the d2k mod where lot's of house actor definitions are inherited and extended. Because I see we're totally in a different world. I really appreciate and admire all of the hard work you guys are doing. Keep it up. We improved our https://github.com/OpenRA/OpenRA/wiki/Traits documentation to aid modders. I also created some test mods that demonstrate inheritance. Much appreciated to Matthias for helping me to getting started. loldatharvester. IIRC OpenRA ignores either header or HVA Transform. I'll keep an eye of this but I doubt it'll change my thoughts about the engine. See https://github.com/OpenRA/OpenRA/issues/4113 for the size problem with non-Westwood voxels. Could you maybe write a short step by step guide how you got to your hello world? It might come in handy when others want to start an OpenRA project and i'm sure Matthias has better things to do than repeating his "getting started" tips again and again for everyone who wants to give OpenRA modding a try. I tried to cleanup the wiki a bit. https://github.com/OpenRA/OpenRA/wiki/Mapping should now be a bit more helpful, a lot of scattered outdated tutorials have been moved to the new self-documentation at https://github.com/OpenRA/OpenRA/wiki/Traits. I also split up the https://github.com/OpenRA/OpenRA/wiki/Pixelart page. The https://github.com/OpenRA/OpenRA/wiki/Modding-Guide still needs some love. The main trick I tried to explain is how you can use MiniYAML rule merging to get started fast. https://github.com/Mailaender/OpenRA/blob/rewire/mods/rewire/mod.yaml#L70 re-uses a lot of the existing TS mod files and simply adds new small rewire *.yaml files that only overwrite certain values that need to be adjusted by adding them on top of the list. The benefit is that things work out of the box and it is easier to maintain instead of just copy and pasting, because all the improvements made to the TS mod like my recent https://github.com/OpenRA/OpenRA/pull/5998 will automatically apply upon git fetch openra/bleed and rebase. OpenRA ignores either header or HVA Transform. 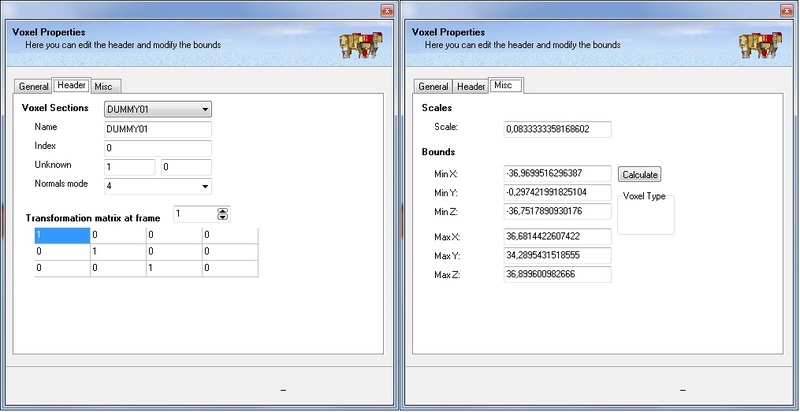 1) WW ignores Scale in the voxel header and VXLSE default is 10x bigger than the value WW used. It's not OpenRA's blame. 2) It did not changed my thoughts alone, but now that I'm looking at it as a modder, I am definitely amazed and definitely orienting towards pro-OpenRA. It's certainly interesting as a C&C engine. That, and the Traits page became a lot more useful than it was a year ago. Kudos. FYI, VXLSE III uses a bigger scale to make editing be viable. I don't think it is possible to have a minimum desirable when you edit the model with scale 1x. I talk about the Scale on the right and not magnification. This scale problem with voxels, is it happening primarily with VXL files from the voxelizer or from the voxel editor? I never used your voxelizer, so I think it comes from the editor. Okay, thanks for that information. However, there is something that everyone needs to be aware of about the voxelizer. In the voxelizer, by default, the bounds are set to 0.7 times what might be expected in order to scrunch the voxel pixels together, to prevent gaps appearing in Westwood Studios games, because they use pixels instead of cubes to represent the voxel data points. Since OpenRA apparently uses cubes, then that technique is totally unnecessary and may be detrimental. In the voxelizer, the setting is called "Voxel Dot Distance" and can be set to just 1 for OpenRA voxels. Right now OpenRA renders voxels as cubes (actually not, but what we do do produces an equivalent image on screen), but this is relatively slow. At some point I plan on rewriting our voxel renderer to introduce the 1 voxel = 1 px assumption in an appropriately (un)scaled coordinate space. That means that setting a large scale will give you a large square pixel on the screen instead of resolving the details of the cube, and you will get gaps if the voxel dot distance isn't set correctly. Having a correct dot distance and a large scale won't give you holes, however. You are actually going to downgrade the voxel renderer of OpenRA to be similar to the one in the Westwood Studios games?! It's not so good to scrunch the data points together to close gaps because then it causes another problem which is: details being occluded by pixels completely overlapping other pixels. In case you are not aware, a lot of VXL files from the voxel editor do not have this problem and therefore appear quite pristine in game from certain simple angles because many artists instead use another technique to prevent gaps which is to make surfaces extra thick voxel-wise. However, this technique is extremely tedious for the artists because the voxelizer and the voxel editor will not do it automatically. Actually, I'm not sure if the voxel editor will do it. As pointed out the people making voxels have learned all the tricks to make the voxels look good already, doesn't matter that it's not the ideal way, it is the known way. Seems silly asking everyone to relearn, or worse edit and re-render voxels for 2 wildly different rendering engines. The RA2 engine creates some really interesting twisting effects when dots start overlapping. It appears the engine rotates the cubes/dots to always be level to the viewer, regardless of voxel angle. pchote: can't you leave anti-aliasing to the video card? If you render with opengl most cards these days have selectable overrides to choose what level ? It all comes down to performance. The current voxel renderer performance scales as roughly [2*(<voxel width> + <length> + <height>) + large constant] times slower than rendering a sprite: in practice, 100 ~ 1000 times slower. Rendering a sprite is very fast, but ~500 x <fast> x <a bunch of voxels> adds up to a lot of GPU/CPU time that could be better spent doing other things. By changing the way we do the rendering we may be able to win a factor of 10 improvement, which means 10 x more units could be rendered on screen (note: not quite that simple in reality) before performance drops. There's no need for the VXL files to be changed even slightly to render well in the ideal voxel renderer. VXL files, designed to look good in the official Westwood Studios engine, will look good in the ideal voxel renderer, but not necessarily vice versa. I'm very disappointed that you guys are downgrading the OpenRA voxel renderer; that was what I was looking forward to the most; seeing voxels look much better finally. We discussed that the official games probably do not actually render the voxels most of the time. The voxels are possibly prerendered to convert them to a bunch of sprites, and then just those sprites are used most of the time instead, in my opinion. the people making voxels have learned all the tricks to make the voxels look good already, doesn't matter that it's not the ideal way, it is the known way. Seems silly asking everyone to relearn, or worse edit and re-render voxels for 2 wildly different rendering engines. The RA2 voxel renderer is tolerable at it's finest. 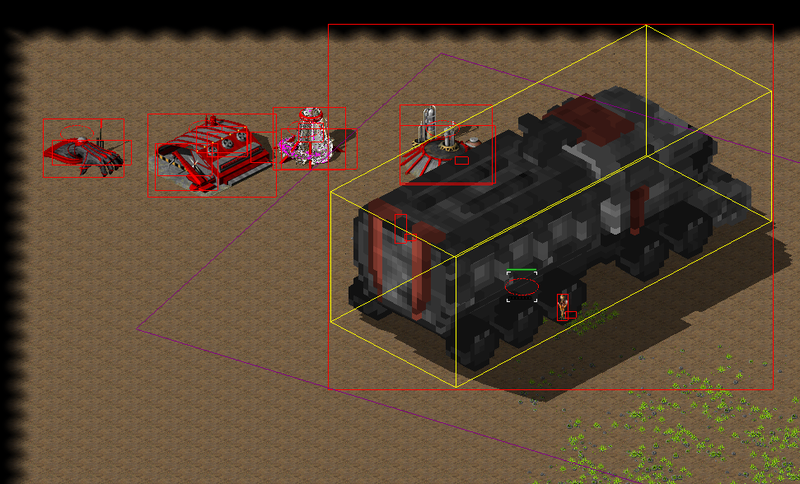 Yes, some people made nice voxels on it, but even those voxels look a LOT more better in OpenRA. Mostly because OpenRA does not use the vpl and isn't limited by it. ATM - besides fixing/maintaining Scale - the OpenRA voxelling style only differs from RA2 in that, for OpenRA you should always remove redundant voxels. That's like... yea, 2 clicks. And you're doing it not because of looks but for gaining performance. The RA2 engine creates some really interesting twisting effects when dots start overlapping. That's not interesting, that's a headache with random bugs (helicopter hides his own rotor blade, barrel overlaps turret - this can't even be fixed 100% unless you merge the barrel into the turret's section). I can see why performance is an issue with the current renderer but I think it should be kept along anyway, as a Renderer: LegacyRenderer trait, and modders could set rare units to evade the visual degradation without that significant perf loss. I wasn't referring specifically to the vpl, that's not really the rendering equation merely the shading/colouring aspect; whether it uses a table for colour values or calculates them on the fly, it shouldn't affect the base rendering style. I was thinking it might be a good idea to have the two different renderers in OpenRA, and then switch between them automatically according to the frame rate. However, because of the 2 methods used to make the voxels appear decent in the Westwood Studios type of voxel renderer (scrunching or redundant thickness), the voxels will not work so ideally in the ideal voxel renderer. Redundant thickness during rendering uses extra memory and processing. Scrunching causes loss of detail and what I call glittering or visual noise caused by too much detail fighting to appear in too few screen render samples. It can be countered somewhat by super-sampling. Anyway, I hope you will stay flexible about the voxel renderer, and not completely discard superior rendering techniques. If the renderer was able to take advantage of multi-core cpus and gpus to do the grunt work, this would solve a lot of the issues for people with quad core 4ghz people like me. Realistically if each rendered voxel was divided into it's own thread, the cpu would handle the shuffling for you, and a few complex voxels wouldn't gum up the works. Of course there's another possible avenue to speed things up, and that's automatically removing redundant voxel data when the game data is loading, which would allow us to continue making RA2 style models, without the performance overhead. I'm sure Banshee could donate the code for that, and in the early versions you could even have the aggressiveness adjustable to find the sweet spot by consensus. This is something that works better if it is preprocessed. It's not a duty from OpenRA itself. The developer can do it in the voxel editor instead. If the developer is sending an non-optimized voxel, it is not up to OpenRA to optimize it everytime it runs or check if it is optimized or not. I don't think that the redundant thickness technique uses so much more memory and processing that it is worth doing something about it. It does. Read pchote again: all voxels are rendered as cubes. This includes the ones you can't even see. Nonetheless, in my tests I could gain performance with removing redundant voxels from the ones I use. The game takes advantage of multi-core cpus as well. Actually it doesn't (note my: "actually not, but what we do do produces an equivalent image on screen" above). The current voxel renderer generates a set of textured slice planes, and so the overall performance and memory use scales with the overall width + height + length bounds but is essentially independent (note: not quite that simple) of the number of filled/empty voxels within each plane. This is something that works better if it is preprocessed. ...it is not up to OpenRA to optimize it everytime it runs or check if it is optimized or not. No reason the voxels couldn't be cached afterwards? Ray-Tracing is more computationally expensive than the solution that pchote has mentioned. Doesn't almost every other implementation, of voxel rendering, in existence, use ray-tracing? I think the vast majority may use it. VXLSE III's for instance, does use it. But it may not be necessarily the best way to deal with this problem. I didn't know your voxel editor used it.